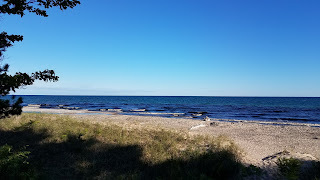 One cannot overstate the beauty of the Upper Peninsula of Michigan and Lake Superior. For me one visit and I was sold. Though I had been up to Houghton, Michigan, as an older child I never recalled much of the visit. 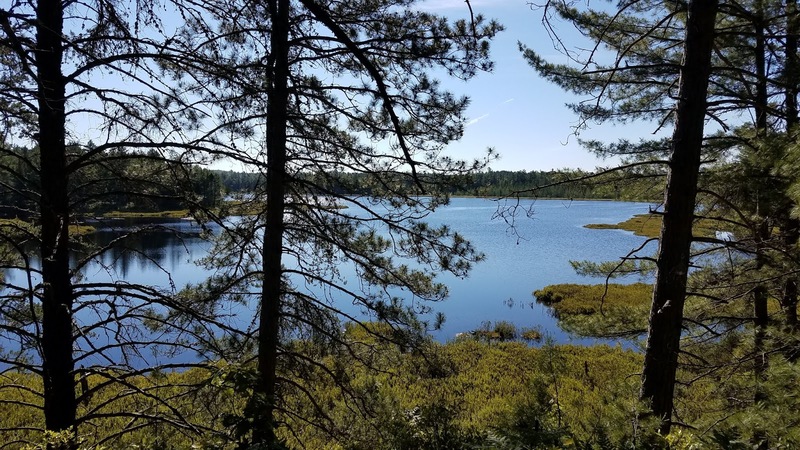 My real introduction to the fullness of the U.P. came in the summer of 2016. 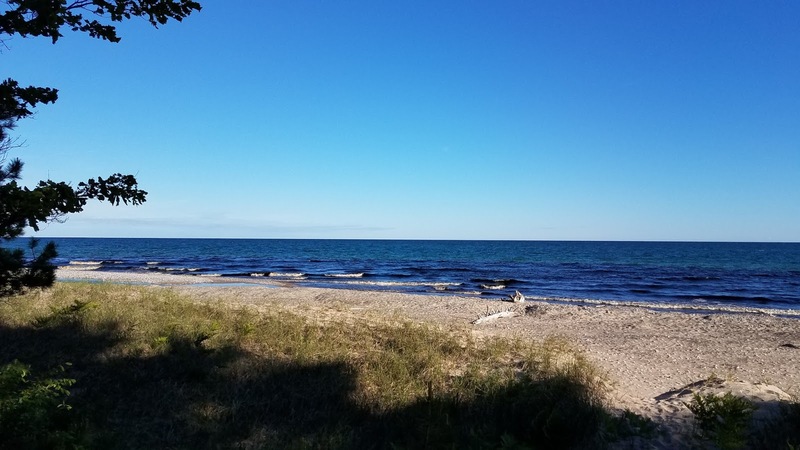 My family and I did a road trip from one side of the U.P. to the other. 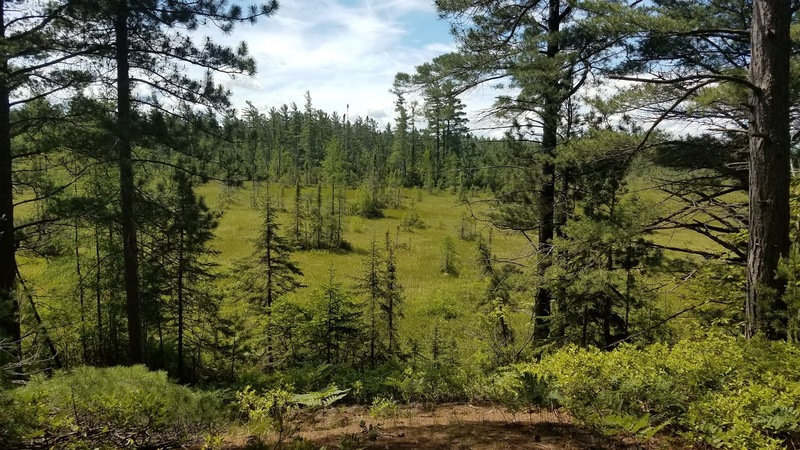 We made stays and hikes at Tahquamenon Falls, Pictured Rocks, the Porcupine Mountains and even Isle Royale. Aside from the well known mosquitos and black flies, the trip and the hiking were outstanding. As I've research new trail races to try over the past couple of years I was frequently drawn to Great Lakes Endurance. They run a number of interesting events in northern Michigan and Wisconsin. 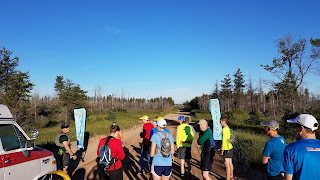 I believe the first race that had caught my attention was the Porcupine Mountains Marathon. 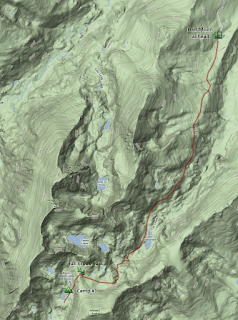 Though this race isn't offered anymore, the thought of running in that beautiful terrain was so very tempting. Instead, I was drawn to the Two Hearted Trail Run. 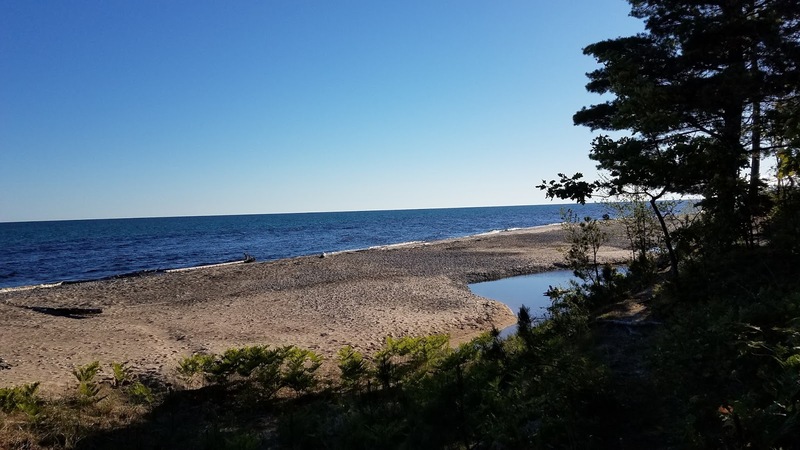 It offers the ability to run alongside the shores of Lake Superior, follow the North Country Trail and end up at Tahquamenon Falls, thus linking together some of the scenic highlights of the U.P. As my 2016 running season ended I decided on this being my marathon of choice for 2017. I registered a few months ahead of time and found that even nearing the race date it seemed registration stayed open. Its one of the luxuries of a small trail race: availability is not a concern and haste is not an issue. 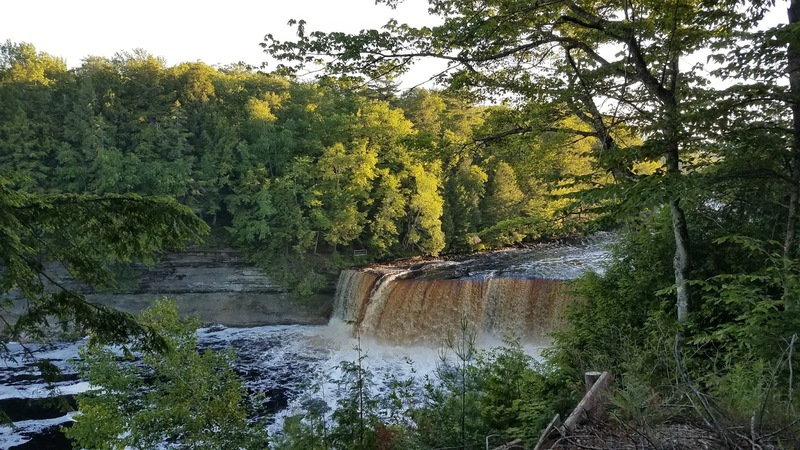 I made plans to camp the night before at the Lower Falls and got a reservation for a camp site close to where my family had camped in 2016. Initially I had made allowance for my family to travel with me if plans would work out. As our 2017 calendar filled out and the days drew near however, my younger son found himself with baseball games filling up the weekend and so it was decided that everyone else would stay home. This would be my first marathon that I didn't have my wife by my side, something neither of us would have chosen as a first option. Its always encouraging to have family, and particularly spouse, cheering you on as a mental help, especially so in a marathon. 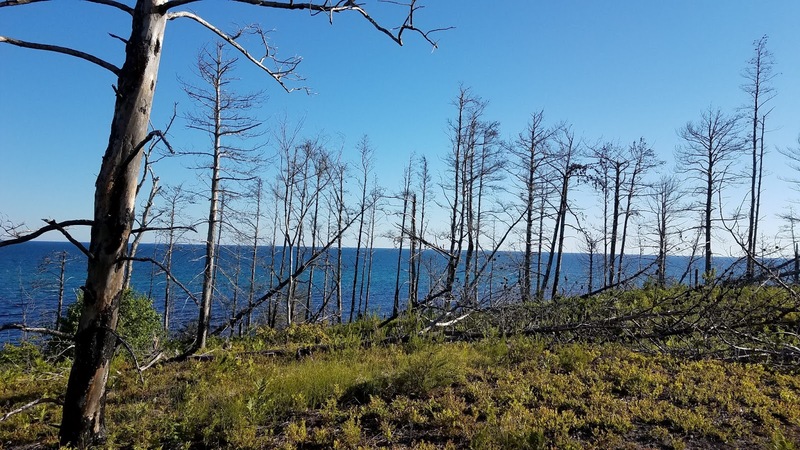 On Friday, June 23 I made the drive up to the U.P. and headed to Newberry where the race directors were holding check-in at the High School. It was an incredibly simple check-in that involved walking in, giving them my name, and then receiving my race bib and race shirt. We were given a choice between blue and yellow shirts. They also had some information posted on a bulletin board and sheets explaining the aid station locations. That was about it. I was in and out in 5 minutes having even stayed to listen to the director answer a few questions another runner had asked. I double-checked the location of the bus pickup in the morning and I was out. I drove on up to the Upper Falls to take a few pictures and debated heading into the Brewery for a drink but ultimately decided to pass. I did drive on over to the General Store just outside the Lower Falls to grab a six of Keweenaw Brewing's "Widow Maker Black Ale" and a snack for the campsite. I had a pleasant evening of camping mostly just getting things ready for the morning and settling in to rest and sleep the night away. For race morning I had alarms set starting at 4:45am. I had plotted out my time carefully and this allowed me enough time to tear down camp, get myself ready and dressed, and drive over to the Upper Falls parking to get the bus. In the last day or two they had moved the bus pickup time to 5:45am from 5:30am, but I wasn't going to take my chances. To tear down camp, I had resolved to simply throw the tent part by part into the back seat for the sake of quickness and knowing there'd be a slight bit of dampness to it all. By 5:20a I was ready to hit the road. I started on some of my breakfast of 2 bananas and 2 oatmeal squares as I drove. In hindsight, I think I could add a bit more to breakfast next time. At the Upper Falls I hit a parking spot and then walked over to the two school buses they had obviously waiting for us runners. For the race today I was wearing my typical blue Salomon running shirt, my black 2-in-1 running shorts, Speedcross Vario trail-runners and I wore my North Country running hat. The hat was a last minute addition hoping to help with bugs. On the bus I was also wearing my Pikes Marathon jacket as the morning air was still a bit chilly. I decided it was light enough I would just carry it in my pack the whole way. For food I was carrying 4 Gu Gels, 2 packages of peanut butter M&M's, 2 CLIF Shot blok packages, and Hammer Endurolytes. This year I was hoping to put in more calories during the race and to do so early in the race. Two weeks prior I had had great success on my Grand Canyon South Rim to North Rim hike in pouring in the calories that I hoped to translate that over to the marathon. The buses were both mostly filled up and we left pretty much right after 5:45am. The drive took almost the full 30 minutes to get over to where the 50K race would start. The buses each parked and dropped everyone off about 200 yards from the 50K start. There were four port-o-potties there for everyone to use, including the Marathon runners. There would be no toilets at the marathon start. Everyone was pouring on bug spray pretty quickly as the mosquitos were fairly thick. The 50K runners all walked to their start and me and 2 or 3 other marathon runners walked with them to see them off. Eventually all the other marathon runners hopped back into the bus that would drive us to our start line. Both start lines were on dirt roads back in the woods, though the scenery was actually quite beautiful and not completely socked in with trees. The harsh weather of the U.P. 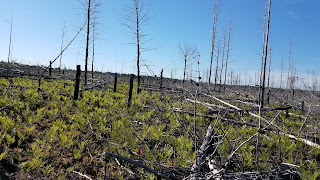 creates beautiful forests as things don't get as thick as they do further south. 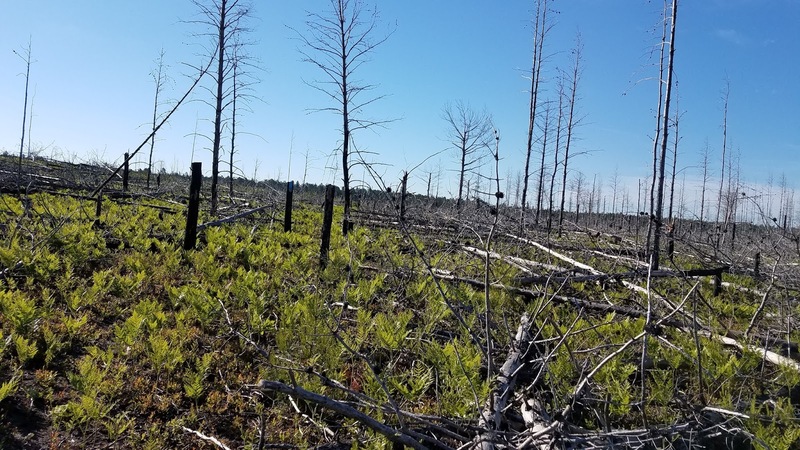 The ground vegetation stays fairly short and the tree cover isn't quite as thick and so this allows for instances of more open scenery. The 50K race began with a "ready, set" and then the ringing of a cow bell. They were all off with a pretty good pace. The marathoners all got back onto the bus and we were driven 5 miles down the road to our starting line. They had half a dozen volunteers waiting there with a table and some water. This was actually the first aid station for the 50K and our start. For the most part, things seemed to run very well for the race and the organization of it went smoothly. We would all be following orange flags on our right side for the whole of the course. At both our start and the 50K start the race director gave a description of the course including warnings of a water section we'd have to walk through and the beaver dam section. Our race finally started and we were about 7 minutes early in starting. 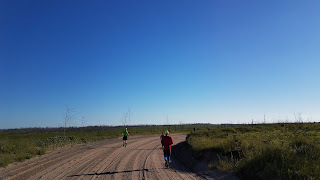 The dirt road was fairly easy to run though it had lines of soft almost sandy dirt in it. I tried to stay on tracks that were well compressed and firm. I had learned early on the course for 2017 varied from the 2016 course in that it didn't follow Lake Superior as long. 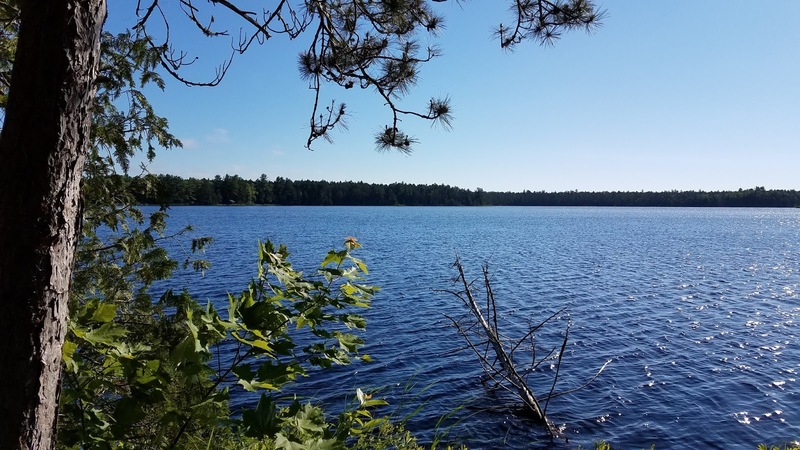 In 2016 it started at Muskallonge State Park and stayed along the lake the first 8-9 miles. This year the first 5 or so were on dirt roads. This disappointed me at first. 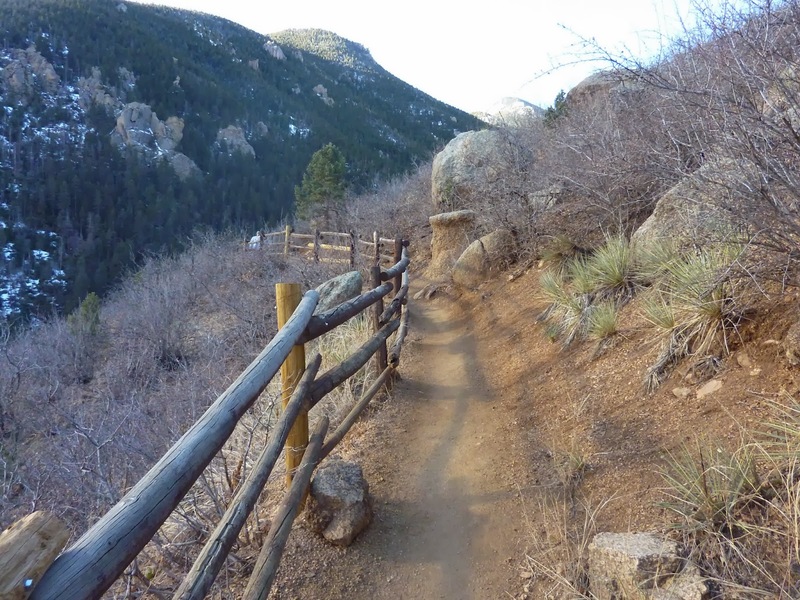 I never did hear why the changes were made, though I wonder if wet and muddy trail conditions contributed? The dirt roads provided a nice mix of scenery that didn't disappoint. It also provided an easy running surface to start on and thin out the pack a bit before we hit the single track. 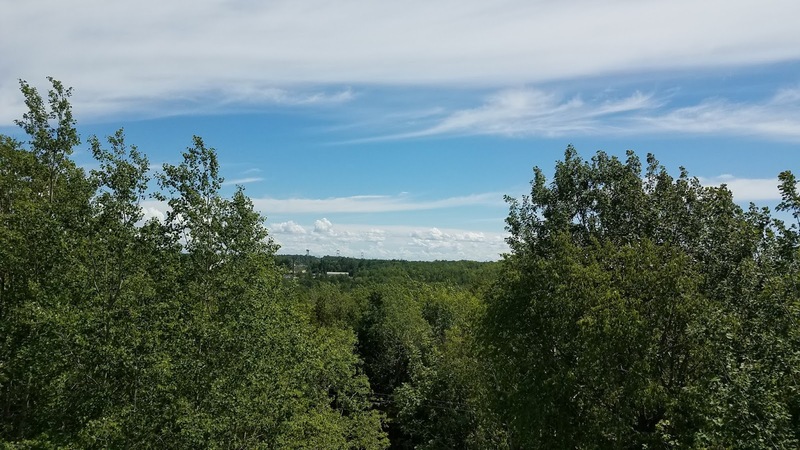 I also finally resolved, we'd still have at least 21 miles on the North Country Trail and that would be more than enough to enjoy. 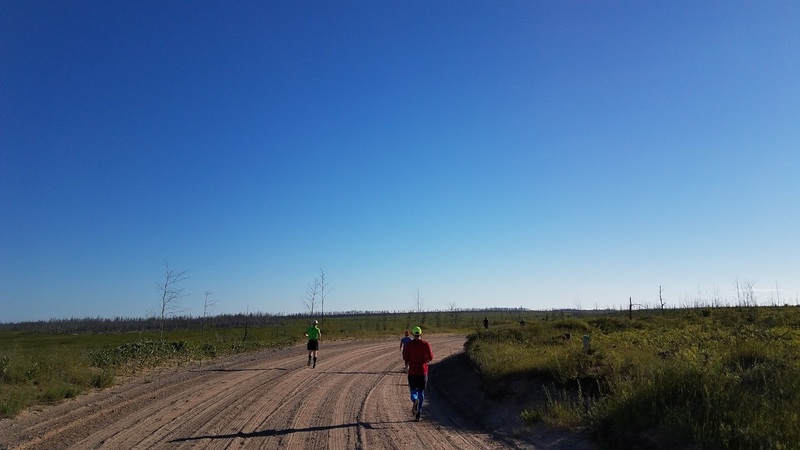 I ran the first miles on the dirt roads averaging about an 8:30 pace. I was feeling fairly well in here, certainly could have gone faster, but felt like I was holding back enough to safe energy for later. Post-race, I would look back and wonder if I had run even slower to start. I was munching on my peanut butter M&M's in the early miles hoping that my digestive system would handle this food better early than it would late. There were small ups and downs on the roads but nothing major. We finally arrived at the Two Hearted Campground which would make an excellent place to camp and enjoy along Lake Superior. This was the marathoners first aid station. A number of volunteers there were good at directing us onto the right turn that would put us onto the campground road. Shortly after this I passed a campsite with two nice individuals who as I passed hollered at me "your turn is right here, your turn is right here". For some reason at first I thought they were just toying with me. As another runner came up from behind me they said the same to him. I slowed down and scouted things out and sure enough I had missed three orange flags that had marked a quick left turn before their site. They had definitely saved me some hassle. I thanked them as I got back onto the trail. From that moment onward we had a few miles on a bluff at the edge of Lake Superior. It had frequent but fairly small ups and downs. The trail remained very narrow and thick ferns at times obscured it to the point where it was very difficult to see. I had another runner on my tail through this section and he and I both kept a close eye out for the trail and for flags. In this area we passed the mouth of the Two Hearted River, I could see it through the narrow line of trees but never got a good view to stop and take a picture. That's something I'd like to go back and see again someday. 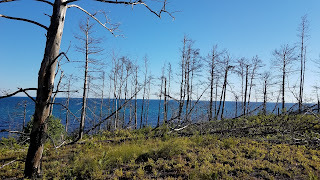 After about only 2 miles along the Lake the trail turned to the southeast and really entered an old burn area. This was interesting terrain. Mostly all short vegetation still with a fair amount of down trees for runners to hop over. 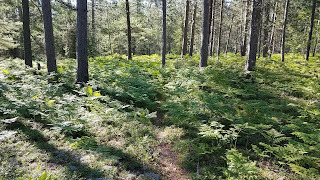 The trail was also thin and almost obscured at times by vegetation but there were sign posts with the North Country marker on them to help lead us along. I talked to a member of my church who snowmobiles this area in winter and he mentioned how impossible it is to navigate out there when it is all snowpacked and featureless. Leaving the burn area we hopped onto the 412 road and went over a small bridge. After the bridge the trail made a right turn onto a very sandy side road. This was grueling as every step came at a price in the sand. I had two runners ahead of me and two more coming up behind at this point. We pushed our way onward for about a half mile on this road not seeing any route markers and suddenly all 5 of us slowed up and discussed whether we had lost the route. I had been periodically checking my phone where I had maps and my GPS track and I could see we were indeed off the NCT. But none of us had seen any markers. Three in our little group decided they wanted to backtrack the road and find the route. 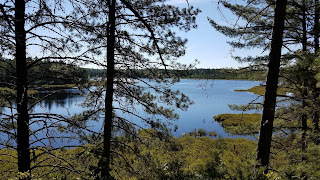 I saw the map and said we were a minute from a road ahead of us that would take us to Culhane Lake campground and we would for certain be back on route. Myself and another gentleman opted for this route. The road made easy passage and we did indeed end up at the Aid Station at the Campground and were back on target. I think distance-wise we came out the same, maybe added a tenth of a mile to our total. 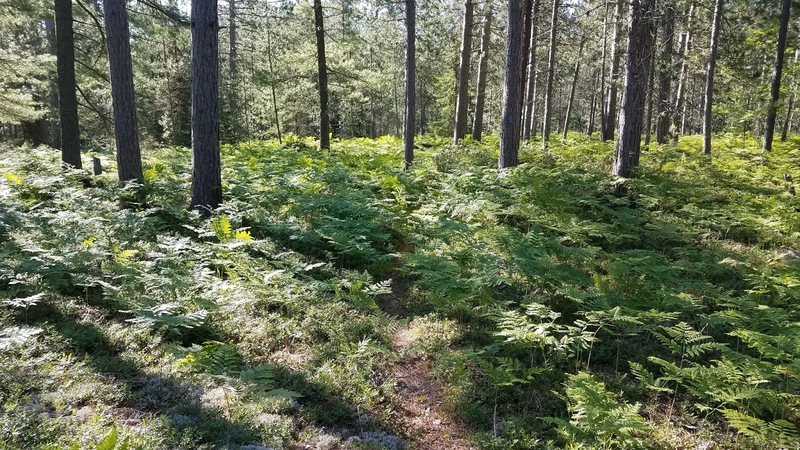 I am certain the other three who backtracked may have added as much as a mile to their totals and who knows how much time trying to find the missing trail. At Culhane Lake Aid Station I had little water left, which was a good thing, and so I had them fill me up from one of their pitchers. They had water and they had Gnarly-brand electrolyte drink. This aid station had their orange-pineapple flavor which was pretty decent. They put in a liter for me and I drank on this til the next aid station. I was still feeling fairly well at this point as we were almost 10 miles in. I would be almost by myself the rest of the race and it would be a lot of singletrack from here on out. It was beautiful forest though, with varying types of vegetation and terrain and I felt the time in there passed nicely. 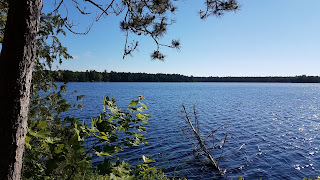 I got some beautiful pictures of Parcell Lake as I passed by it. When I pulled into the 414 Aid Station (3) I was still pulling along fairly well. My pace had slowed slightly but this was largely due to the terrain. Here at this aid station I thought I made a good choice in filling my hydration up with more Gnarly electrolyte drink. Not. I didn't pay attention to the fact that this time the drink had a pinkish-red color until I was back on trail and found out it was the raspberry flavor. Yuck. It may not be Gnarly's fault necessarily because I just generally don't care for raspberry. But this was just bad. I kept drinking on it as I needed the fluids but every drink just made me cringe. Food-wise by this time I had put in both bags of M&M's, I had in 2 Gu gels and one of my CLIF Shot Blok packages. The aid stations were also offering gels and even some had Hammer Endurolytes. For the most part I didn't take any aid station food except for one Gel package. Heading south from the 414 Aid Station the route now is a double-track trail on an old dirt road. This helped progress a bit except for the fact that I was now quickly running out of steam. I could tell my heart rate was high and when this happens it affects breathing and quickly uses up energy. I could tell the last 5-6 miles my heart rate was up and this was a bad omen as I didn't feel as though I was pushing much of a pace. I would spend the remainder of the race, and afterwards, trying to pinpoint how things were seemingly going wrong again. My training in 2017 up until the beginning of June had been superb. I set course PR's at the Trail Half in late April and on Highland Loops in mid-May. I had for the first time almost perfectly followed my training plan to good results. The only seemingly obvious culprit for what was suddenly transpiring in this race was my Grand Canyon Hiking Trip. That felt like the obvious elephant in the room. On June 5-7 my brother David and I hiked Rim to Rim to Rim in the Grand Canyon, and then also hiked Humphrey's Peak on the third day. We racked up 55 trail miles in 3 days. The Rim hikes in the Grand Canyon were near marathon efforts and at the end of the second day as I finished I felt every symptom of a post-marathon effort. While I wouldn't have traded those hikes in for anything, they were a big blip on my marathon training plan. I could tell in my runs in the two weeks after returning from Arizona that I wasn't quite back to normal. This amounted to my marathon effort going south from about mile 15 and onward. I had had a goal of 4:30 on this run thinking I could do it faster and better than my 2015 effort at the North Country Run where I finished with a 4:55. 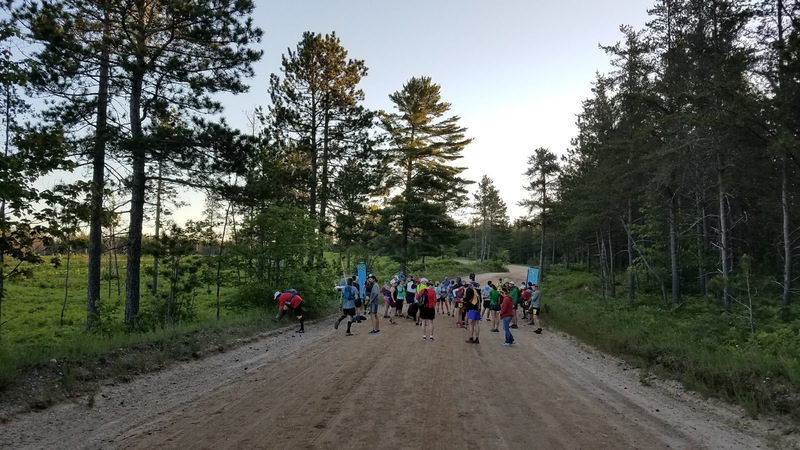 Back to the Two Hearted Course, one of the course features the race director had warned everyone about was a large water area which he described as "South of the 414 Aid Station you'll come to a water area, Yes, you will have to go through it, No, there is no way around it." Indeed, his description was accurate. Running along the doubletrack road suddenly there was a massive puddle covering the road for probably 100-150 feet. We were even told it would be knee, possibly waist deep. For me it was about knee deep and the water fairly cool. I just slowly sloshed through it accepting the wet feet and shoes that would come with it. Thankfully, as I would learn later, my trail runners drain and dry fairly well. My shoes and socks would never get completely dry, but would become comfortable enough after a few miles. It wasn't more than a half mile after the puddles that the doubletrack road ended and we were back on single track and cutting east again. It was in here that my running ability was just about shot. We had 2 miles of singletrack in the woods until this would spit us out onto the 500 Road. I would run for just a short bit until my heart rate would spike and then I would drop back into a brisk walk pace. I just didn't have any energy left in the tank. It was frustrating to say the least. When we popped out onto the road we had another small puddle to go through before doing so so that our shoes got all soaked again. We were on the 500 road for half a mile and it was paved with a slight uphill slant to it. I tried a light jog for some of it and wanted to jog at least into the Aid Station. There I made sure to dump out as fully as possible whatever remannts remained of the raspberry drink as I just couldn't tolerate it anymore. I had them fill me with water here. They had Honey Stinger waffles at this aid along with Endurolytes and Gels. I had a bit of my own food left so I didn't grab any of their food, just the water. I had been also using my own Endurolytes periodically hoping to stave off cramps and get some sort of energy. But by this point, my body was just about wrecked. I had 6 miles to go and I would do almost no more running the rest of the way as the body just wouldn't allow it. Even when I would muster up a bit of energy to increase the pace, I would last about 30-40 seconds and sense a leg muscle about to cramp up. I was fortunate today that I never had a muscle go full blown cramp like I did on North Country which basically put me on the ground. I didn't have any on Pikes last year either, but like with last year, I could sense them always close at hand. The last 6 miles were simply a grunt. The hills were small and modest though things never remained completely flat either. Aside from the building exhaustion and frustration, the other real challenge was the flies. The mosquitos didn't seem to bother anyone running as long we one kept moving. The flies however would continuously hover around your head occasionally trying to land and bite. Even though I was warm and sweating well I put my running hat back on to help with this. I would put more bug spray on and I would swat at those little *@#$#+ but they would continue to fly little holding patterns around my head. It felt like the same ones followed me for miles. At about 24 miles we passed the beaver dam area. Its actually hard to describe it in words and I unfortunately didn't have the wherewithal to grab get a picture. It was like running on the edge of a dam that quickly transitioned into the forest. There were mud puddles and tree roots mixed in it all. It was a challenge to keep the shoes out of the mud and still follow the trail. To the left, often at my knee's height would be dam like mounds of tree branches and mud that beavers had constructed, with small ponds on the other side. In this area I had another runner, who would finish only a minute or so ahead of me, catch up and ask if I had extra water. I happily pulled out my hydration bladder and saw I had half a liter left, I poured him about half of it knowing we weren't too far from the finish. He was kind and grateful. 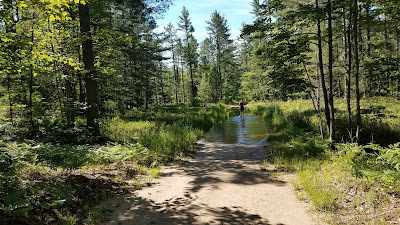 The last two miles had a few muddy spots and were also on some of the Tahquamenon Falls trails. I passed signage for one of the big oak trees that are the highlights of those trails. Again, I wished I had had the energy to stop for a picture. When I passed M123 I at least knew I had almost made it. It was a short jaunt down a service road from there and then on grassy trail around a retention pond and into the finish line by the bathrooms at the Upper Falls. I had been wondering where they would setup the finish and was glad to see it where it was as that meant it was close to the parking lots. I finished with a 5:15, about 45 minutes slower than desired. Full of frustration I had now added up 3 of 4 very frustrating marathon finishes and was left wondering where to go from here to improve this. Ironically, my only marathon finish in which I beat my goal and was ecstatic with my race was also the very hardest of courses, last year's Pikes Peak Marathon. Go figure. At the finish they had runners walk up to their timing table, they would scan the bib and it would instantly print out a receipt with your time and finishing places. Really nice job by Superior Timing. We would then take the receipt over to the medals table where they would hand you a finisher's medal and if you placed top 3 in your age group, which sadly I did, you would get an award. For me it was a jar of maple syrup. Honestly, I didn't feel like I deserved an age group award, though it helps when there are only 4 in your age group. In all, I was pleased with the Two Hearted course and for that alone I would return. 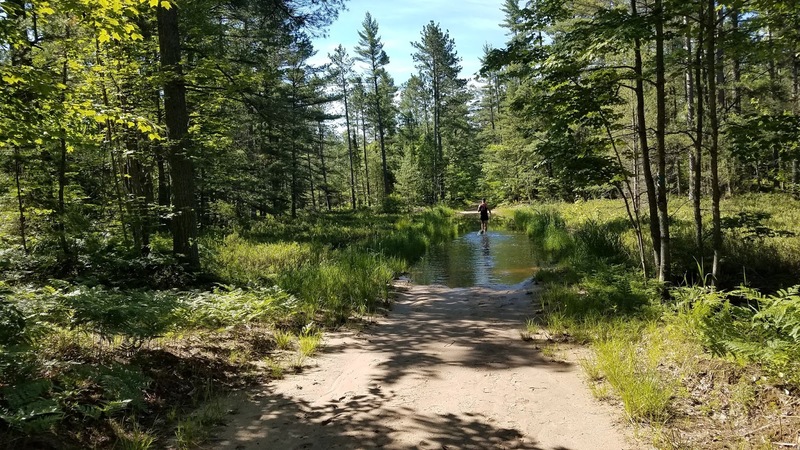 Great Lakes Endurance did a very nice job in organizing things and I would be tempted to try one of their two other Northern Michigan trail marathons. Now I just need to figure out where my problems are arising in my marathon finishes.